Self-contained accomodates up to 6 people. You will need to provide your own bed linen, pillows, blankets and towels. ( If required bed linen can be hired - $15 per bed ). Happy Wanderer Holiday Resort is centrally located on the Western side of the Grampians National Park at Wartook, approximately 30 minutes from Halls Gap and Horsham. Caravan accommodation provides budget accommodation for families or small groups. External private ensuite bathroom. Suitable for 2 adults and 4 children ( or 4 adults and 2 children). Double bed at one end, kitchen / dining in the centre and two sets of bunks at other end. All bed rooms have curtains to pull across. Kitchen has an electric cook top and grill (no oven). Blankets and pillows provided. BYO all bedding and towels. 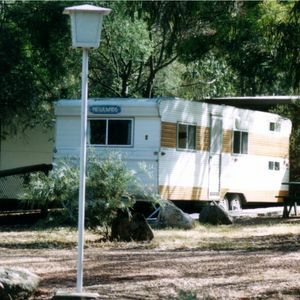 Four caravans to select from as well as other types of park accommodation. Visitors can experience bush walking in the Grampians National Park, nearby Mt Zero, MacKenzie Falls. View native Kangaroos and Emus. Very popular for Wild Life photographers. * Extras: Add $15 per adult and $10 per child (under 16 years) for every night of accommodation.